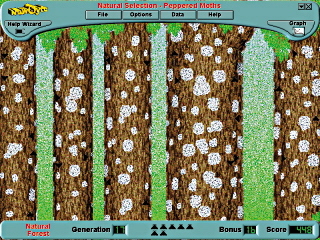 Simulate the effect of predation on peppered moths under different pollution conditions. Explore natural selection at work. The simulation will give your students a firsthand understanding of how changes in the environment can result in changes in the appearance of members of a population. The Teachers' manual includes blackline masters for 4 experiments. Your students will become directly involved in the natural selection process by acting as predators on frogs with different colour and poison characteristics. 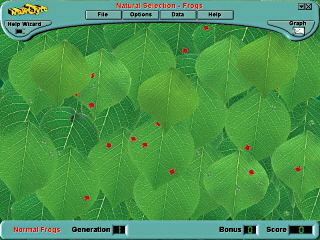 The simulation will enable students to become acquainted with how features, such a bright colour, may be an advantage for some frogs but a disadvantage for others. The manual includes 3 experiments as blackline masters. The simulation will allow you to examine the effects of predation on subgroups within a population and the effect of population size on the viability of such groups. 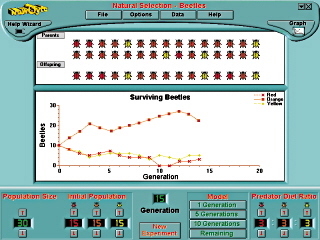 By interacting with the simulation the students will gain an understanding of how predation of subgroups within a population can result in a balance or imbalance between beetles of different colours. The Teachers' manual includes 3 experiments as blackline masters.